Want to bake the most-awesome-ever cupcakes? Or surprise your family with breakfast tacos on Sunday morning? Looking for a quick snack after school? Or maybe something special for a sleepover? It’s all here. With our collection of 100+ foolproof recipes and the kids apron seen on our TV show, your young chef will be looking and cooking like a pro! 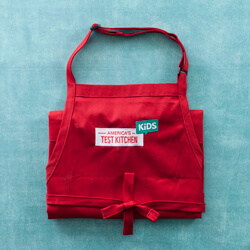 For the first time ever, America’s Test Kitchen is bringing our scientific know-how, rigorous testing, and hands-on learning to help KIDS in the kitchen! Recipes include French Toast for One, Monkey Bread, Hummus, Guacamole, Best Hot Chocolate, Pesto Flatbread “Pizza”, Roasted Tomato and Corn Tostadas, Sesame Noodles with Snow Peas and Carrots, Crispy Baked Cod, Sheet Pan Pizza, Quinoa with Herbs, Mexican Street Corn, Banana Bread, Birthday Cupcakes, and Fudgy Chocolate Mug Cakes. America's Test Kitchen Kids: Kids Cook!